Roger Oakland of UNDERSTAND THE TIMES, and Pastor Chris Quintana of CALVARY CHAPEL CYPRESS discuss End Times from a Biblical perspective. They also address the fact how many Christians are unaware of what is taking place in the name of Christianity and how we all need to wake up. Contemplative Prayer, the Emergent Church, doctrines of demons, and many more things are discussed. Lord willing, I will continue to add any new programs they do in this series to the Playlist that I have added for you below). Today Pastor Chris Quintana began preaching from Chapter 3 in the Gospel of John. His focus was only on the first three verses today, but he goes into detail concerning the importance of salvation and the words that Jesus spoke to Nicodemus that he must be born-again in order to enter heaven, and how that applies to all of us. If you have never heard the gospel before, or if you don’t understand your need for a Savior, I hope you will take the time to listen to his message. Lord willing, I will be adding all of his teachings from Chapter 3 to this video Playlist for you as he continues to preach from the Gospel of John. So please consider stopping back here on the Sundays to come to hear these very important messages by Pastor Chris, because each of our eternal destinies are determined by the choices we make concerning who Jesus Christ is. Will you choose to place your trust in Jesus Christ alone for your salvation? Or will you choose to go your own way by trusting that your good works will outweigh the bad you have done on that day when you stand before Him? Eternity is forever. Don’t delay making your choice. Tomorrow is promised to no one. “As the saying goes, “There are many roads to God.” That may comfort some people enough not to look further, but is it biblical? It is based on the notion that it will all work out in the end, but what a dangerous wager that is. Can a person come to God on their own terms and not see what the bible says on the matter? Does the bible make absolute statement, which cannot be ignored, especially on heaven or hell questions? Consider our text this morning (John 3:1-3) regarding the question of Nicodemus, and the answer Jesus gives him. In asking about what Jesus had done, and noticing the power behind it, he is perplexed. So he asks, or better yet makes a statement about authority, and by what power Jesus does what He does. Jesus simply answers the question which Nicodemus needs to know. A spiritual rebirth is needed, and Nicodemus is blind to his need. He needs to be Born Again. That couldn’t be done by a man’s will, nor by some religious observance. It wasn’t through the administration of some church, they didn’t exist. It was simply a matter of being “Born Again”. Yes, Jesus used the term first, and it is a matter of faith. When time allows, I hope you will listen and be blessed by the preaching of God’s Word by Pastor Chris Quintana. “Destruction and misery are in their ways: And the way of peace have they not known: There is no fear of God before their eyes. Now we know that what things soever the law saith, it saith to them who are under the law: that every mouth may be stopped, and all the world may become guilty before God. Therefore by the deeds of the law there shall no flesh be justified in his sight: for by the law is the knowledge of sin. For those of you who watched the excellent Conference this past weekend, ‘The Remaining And Ongoing Dangers of the Emergent Church Movement,’ you will be excited to hear that Pastor Chris Quintana will be having a similar Conference at his church, Calvary Chapel Cypress, next month! So mark Friday, March 11th and Saturday, March 12th on your calendars! Normally his conferences are always posted on YouTube, and I will post them here for you if they are. The guest speakers at this Conference will be Warren Smith, Roger Oakland, Jim Fletcher, and Russ Miller. I am sure it will be another excellent Conference with a lot of very important information to make you aware of what is happening in the name of Christianity, and, as always, there will be a strong emphasis on God’s Word and the need for spiritual discernment. Thank you very much for stopping by and taking time out of your weekend to read some of my posts and poems. With the Christmas season now upon us, I thought the following sermon series on the Gospel of John by Pastor Chris Quintana of CALVARY CHAPEL CYPRESS would be the perfect one to present to you for today! Although no one knows exactly when Jesus Christ was actually born, the fact remains that Jesus, who eternally existed with God the Father, and the Spirit before time began, did at one point enter our world. Jesus Christ, willingly came and was cloaked in human flesh. He remained as God, but took on an additional nature and became a man to live the perfect sinless life that we could never live, to one day become the perfect sacrifice for my sins and for yours. If you have never put your trust in Jesus Christ and His sacrificial death in your place on the cross as full payment for your sins and placed your full trust in Him to be your Savior instead of trusting in your good works and trying your best hoping to be accepted by God after you die, I pray that you will receive Him even today! His free gift of salvation awaits those whosoever will come! 27 He it is, who coming after me is preferred before me, whose shoe’s latchet I am not worthy to unloose. 40 One of the two which heard John speak, and followed him, was Andrew, Simon Peter’s brother. “Today we begin The Gospel of John as our Sunday Morning book. It is unique among the 4 gospels as it emphasizes the deity and eternal nature of Jesus in the first verses. The other gospels begin at the time of Jesus birth or earthly ministry. John begins with the preexistence of Jesus and the implications of that set the tone for the entirety of the book. “John’s Gospel was written at the close of the first century roughly 3-4 decades after the first 3 (exact dates are unknown) It seems reasonable for John to emphasize what he does, and give the detail that he does, given the lateness of the writing and content already covered in the other three. John’s Gospel gives us detail which adds so much wondrous and absolute truth to an already perfect account in the other 3. There are common events covered which are found in the other 3, but much of what John teaches is unique to his account. Those unique passages and what they teach help fill in details and aspects of Jesus’ life and serve as essential doctrinal and theological for the foundation of the faith. “John 1:3-5 is the text this morning. Only God can create, Genesis 1:1 tells us that and John tells us that Jesus was the one through whom all things were created, thus making Him not of this creation, no matter what the cults say. The next 2 verses are enormous in their implication. (as though verse 3 wasn’t?) Verse 4 tells us that He embodies Light and Life. Since He is the possessor of “life” in the eternal sense, and “light” as in making things pertaining to the eternal life knowable, He is then able to make them available to all who ask. Verse 5 tells us that darkness hides these things from man’s eyes. Why? How? When we get to John 3 Jesus tells Nicodemus that men loved darkness and so they are blinded from coming to Jesus and having that darkness lifted to see all things and let life in. “John 1:6-13 is our text today and it tells us several important things. Beginning with John The Baptist and his message that messiah had arrived, just as the Old Testament had said would happen. John was that prophet which the Old testament prophesied would come prior to messiah’s arrival. John will come back to John The Baptist later in the chapter. John then turns his attention back to Jesus, The One who brings Light to all men. As he did in the previous verses he declares that Jesus was light and life, he focuses more on light (illumination of truth) and how Jesus provides that light to all men. He concludes this thought by pointing out that the world Jesus came to, which He made, did not know Him. And those, (The Jewish people, as a whole) did not receive Him. But those who did (Jew and Gentile alike) were given the right to be numbered among the Sons (And Daughters) of God. (I will continue to add his future sermons on the Gospel of John to this Playlist as soon as they become available). I worked on writing my upcoming post (Lord willing) concerning Mysticism for at least eight hours on Saturday, but the more research I did, the more I realized that it will be impossible to complete it by this evening as I had hoped that I would. Lord willing, I will be working on in every chance that I get in the days to come, but for now I need to get some cleaning done! I will also be sharing some expository preaching with you, but sadly, that is a very rare thing to find these days. I’m sure that many of you can attest to that undeniable fact. Sadly, many pastors today who seek to grow their churches oftentimes resort to distorting God’s Word either by taking a verse out of context, or by interjecting their own ideas into the text to make it say what they want a verse of Scripture to say (eisegesis). 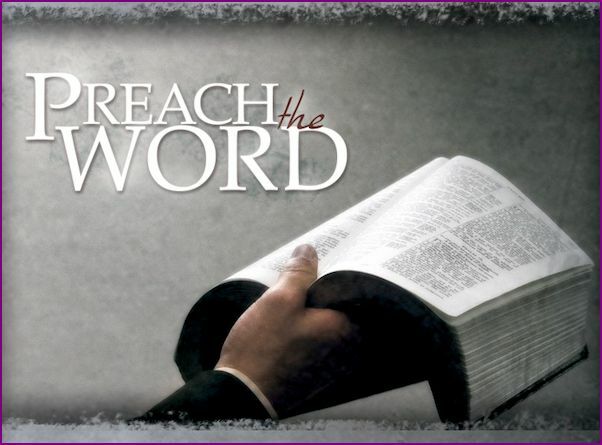 “In the presence of God and of Christ Jesus, who will judge the living and the dead, and in view of his appearing and his kingdom, I give you this charge: 2 Preach the word; be prepared in season and out of season; correct, rebuke and encourage—with great patience and careful instruction. 3 For the time will come when people will not put up with sound doctrine. Instead, to suit their own desires, they will gather around them a great number of teachers to say what their itching ears want to hear. 4 They will turn their ears away from the truth and turn aside to myths. 5 But you, keep your head in all situations, endure hardship, do the work of an evangelist, discharge all the duties of your ministry.6 For I am already being poured out like a drink offering, and the time for my departure is near. 7 I have fought the good fight, I have finished the race, I have kept the faith. 8 Now there is in store for me the crown of righteousness, which the Lord, the righteous Judge, will award to me on that day—and not only to me, but also to all who have longed for his appearing.9 Do your best to come to me quickly, 10 for Demas, because he loved this world, has deserted me and has gone to Thessalonica. Crescens has gone to Galatia, and Titus to Dalmatia. 11 Only Luke is with me. Get Mark and bring him with you, because he is helpful to me in my ministry. 12 I sent Tychicus to Ephesus. 13 When you come, bring the cloak that I left with Carpus at Troas, and my scrolls, especially the parchments.14 Alexander the metalworker did me a great deal of harm. The Lord will repay him for what he has done. 15 You too should be on your guard against him, because he strongly opposed our message.16 At my first defense, no one came to my support, but everyone deserted me. May it not be held against them. 17 But the Lord stood at my side and gave me strength, so that through me the message might be fully proclaimed and all the Gentiles might hear it. And I was delivered from the lion’s mouth. 18 The Lord will rescue me from every evil attack and will bring me safely to his heavenly kingdom. To him be glory for ever and ever. Amen. Sunday 9/20/15 Lord willing, new post coming tomorrow morning. However, it won’t be a Mysticism Monday post. UPDATE 9/21/15 1:05 p.m. – This new post is taking much longer than expected. I am continuing to do research at this very moment. Lord willing, I hope to have it completed by 3:00 p.m. today, possibly sooner. Maybe you are one of those people who faithfully stand for Biblical truth and you recently had to leave your church because of what has been taking place as you have witnessed your pastor slowly drift from Biblical truth. Or maybe you left your church many years ago and you still haven’t found a church where the pastor preaches from God’s Word. If so, I have all of you in mind when posting these teachings and videos, as well. I hope that everyone who somehow finds there way here will be blessed and encouraged by the many Biblical teachings that I will be sharing with you in the weeks and months ahead –Lord willing. In the following sermon, Pastor Chris Quintana, Senior Pastor of Calvary Chapel Cypress, preaches verse by verse through 1 Timothy Chapter 4, focusing on the qualifications of overseers, as well as the conduct of godly Christian leaders. Before he begins, he shares a very short review of his teaching on Chapter 3 from last week. When time allows, grab yourself a refreshing bottle of water or a glass of cold lemonade, etc., sit down and get comfortable, and open your Bible to 1 Timothy 4, and follow along as you listen to his message. As you listen, see how your pastor compares to the qualifications that God has set forth in His Word concerning what the character and conduct of a godly leader should be like. If you’d like to visit his Calvary Church Cypress website, you can do so by clicking HERE. You can also connect with him on Facebook by clicking HERE. I will be posting more of his sermons and teachings in the near future, so if you’re interested, you can check back here from time to time. Chris Quintana is one of few Pastors and teachers today who not only has a high view of Scripture, but also he is one among very few pastors today who exposes the many false teachings that are entering the church today and leading many Christian astray. As I often say in my posts: Please make sure that you test his teachings — as well as the teachings of everyone that you listen to, no matter how long they have been in ministry — against the truth of God’s Word to see if what is being said is true (Acts 17:11), so that you will never be led astray. Thank you for stopping by and taking time out of your relaxing weekend (at least I hope it was) to read some of my posts and poems.